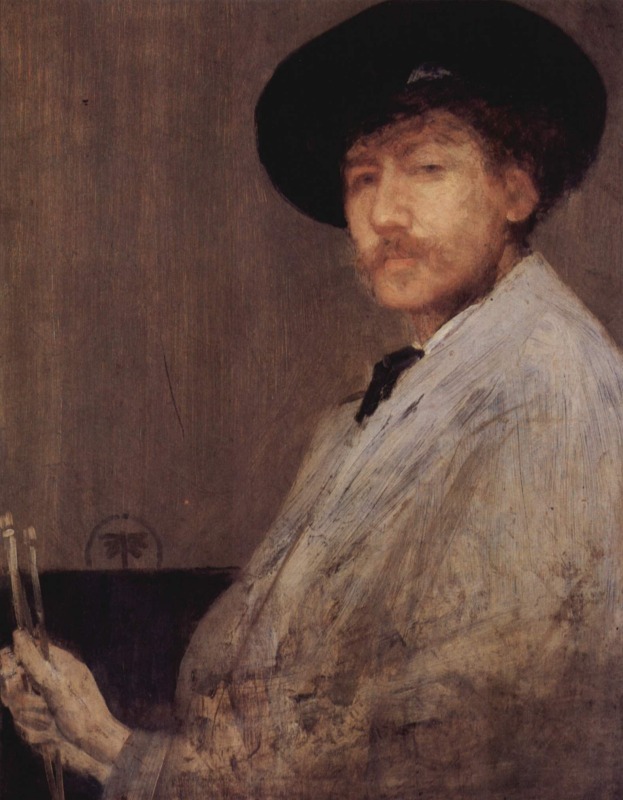 James A. Whistler was born in Massachusetts. His father, Major George Washington Whistler, who had graduated from West Point, was a civil engineer. His mother Anna McNeill came from an aristocratic southern family. When he was nine the family moved to Russia where his father oversaw the building of the St. Petersburg and Moscow Railroad. Six years later his father died and the family returned to America. James himself entered West Point, but dropped out in his third year when he failed to pass a chemistry exam. He was later quoted as saying, "Had silicon been a gas I would have been a 'Major-General'." He worked for a while as a draftsman drawing maps, but he got in trouble for drawing pictures in the margins of the maps. He finally decided to just pursue art, and in 1855 he sailed to Paris. He was to never return to America. He moved to London. He began to use musical terms to name his paintings; words such as Arrangements, Harmonies, Symphonies, Nocturnes, Notes, and Caprices. He painted a portrait of Lady Archibald Campbell. It was not a commissioned painting and she and her friends thought it was ugly when it was finished. She didn't want other people to know she was the subject. 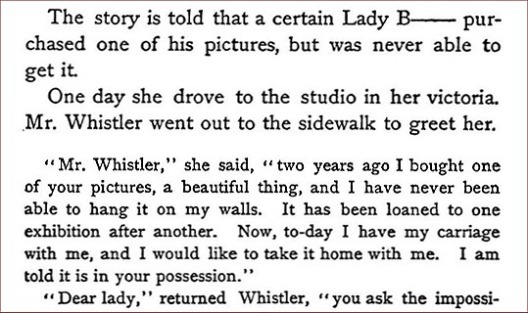 Whistler assured her he would not call it by her name, but would call it The Yellow Buskin. Little did she know that it would someday become famous. 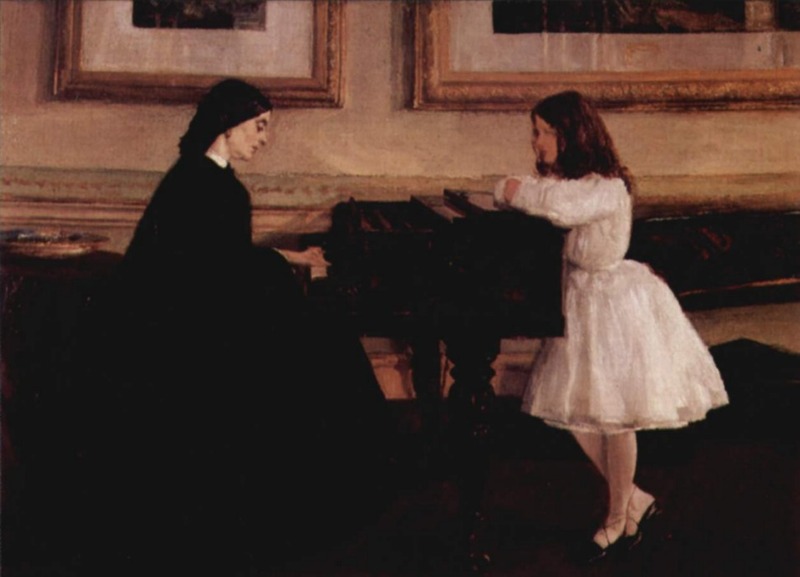 At the Piano was Whistler's first major work. 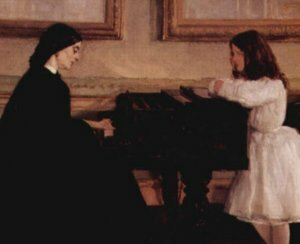 In it we see Whistler's half-sister Deborah and her daughter Annie. The clothing they are wearing is the tradional dress for people in mourning; black for the mother and white for the child. 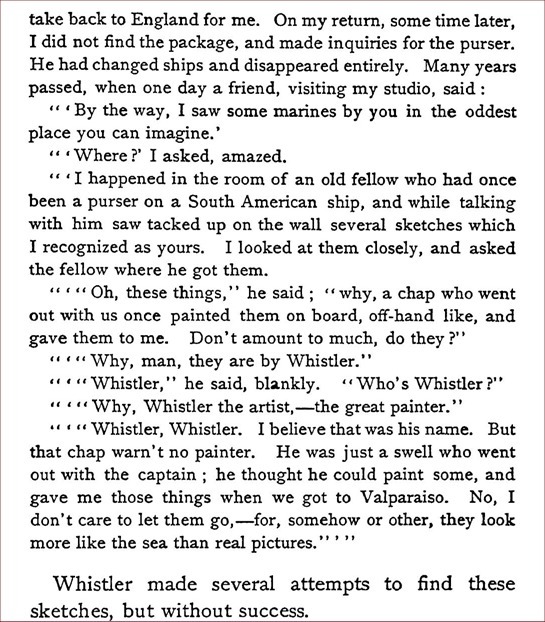 Whistler's father had died ten years earlier, but he doesn't connect the title with anything about the reason for mourning clothes. 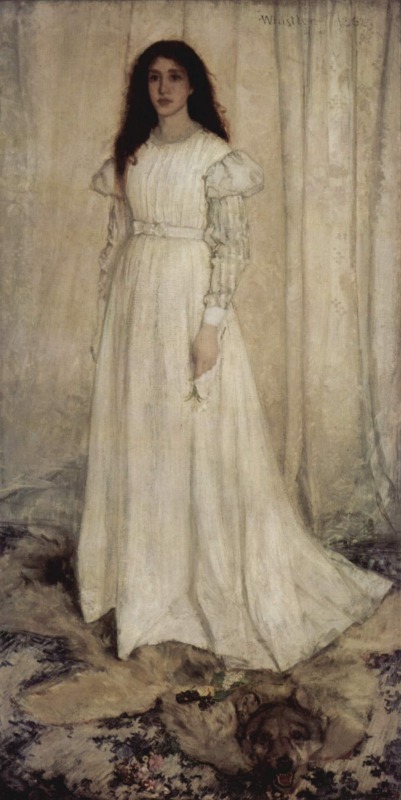 The portrait of Lady Meux is of a London socialite Valerie Susan Meux. He painted several portraits of her. The first was Arrangement in Black, No. 5. His first successful showing in Paris was at an exhibit of independent artists. The painting was called Symphony in White No. 2. When he painted Symphony in White No. 1 he first titled it The White Girl and then renamed it six years later. 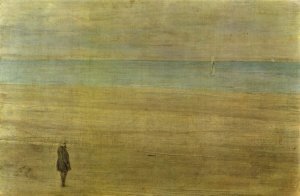 People tried to figure out the "meaning" of the painting, but Whistler said it was just a model and there was no other meaning. When he was painting it, in order to dissuade others from reading meaning into the picture which was not there, he told the model to hang her hands down loosely at her sides and not to express emotion in her face. In 1866 he painted Symphony in White No. 3. 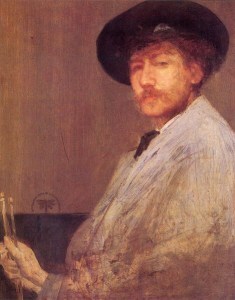 Whistler's theory was "art for art's sake". There didn't have to be a deeper meaning to his work. Theodore Duret was an art critic and collector. He was a wealthy man and had a lot of time to pursue his interest in art. 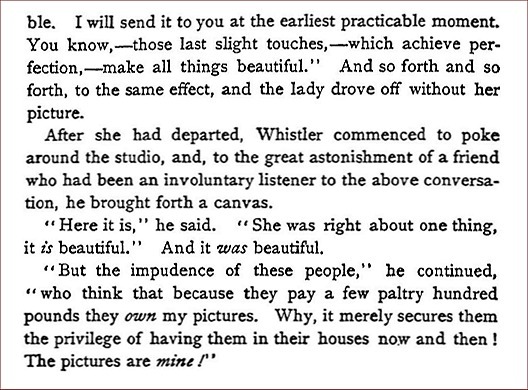 Whistler suggested to Duret that he would like to paint him in evening clothes and asked him to get a pink "domino" or cape for an accent in the picture. Duret purchased such a garment from a theater costumer. Whistler worked on this painting for a long time. Read about the portrait. Manet also made a painting of Duret. Which do you like the best? Trouville is an area on the Normandy coast in France. 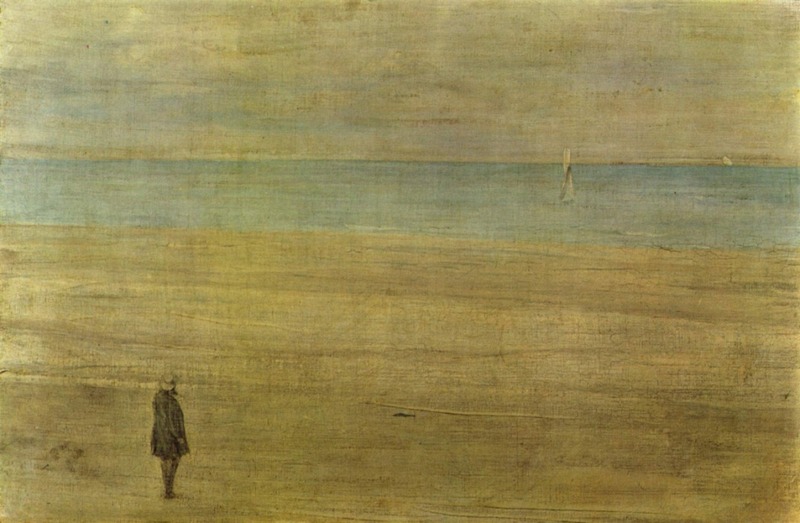 Whistler's scene shows a deserted beach. You can still find deserted beaches there today, but much of the coastal area is developed into resorts. 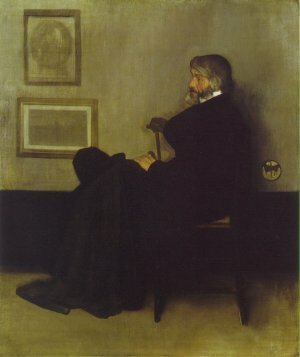 After visiting Whistler's studio and viewing the painting of Whistler's mother, Thomas Carlyle asked the artist to paint a portrait of him. Carlyle was a near neighbor. He would patiently pose for long, tedious sittings. 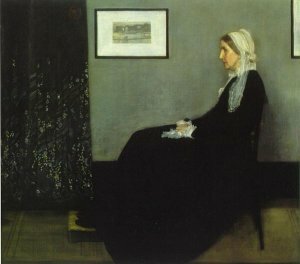 When you compare the portrait of Carlyle and the portrait of Whistler's mother you will notice a similar pose and arrangement. Whistler studied in Venice for a year or so and made a series of etchings there. He returned to London. Some people ridiculed his work and did not take him seriously as an artist. He wanted to be viewed as a man-about-town. When he was in public, he appeared to be careless and idle, but when he went to work in his studio, he was just the opposite. The Falling Rocket is a close-up of the Battersea Bridge painting. The scene shows a place in London where they had a fireworks display every night. The critic John Ruskin said this painting looked as if the artist is "flinging a pot of paint in the public's face". Whistler sued him for libel because of his remarks. At one point in the trial the counsel was told he was holding the painting upside-down. When asked how do you know which is the top and which is the bottom, the reply was, "Oh, I don't know; only when I saw it hanging in the Grosvenor Gallery it was the other side up". Whistler won the case, but the small amount of money he recovered from it did not pay the expenses, and he had to declare bankruptcy. The damages were assessed at one farthing. Whistler wore the coin on his chain long afterwards. 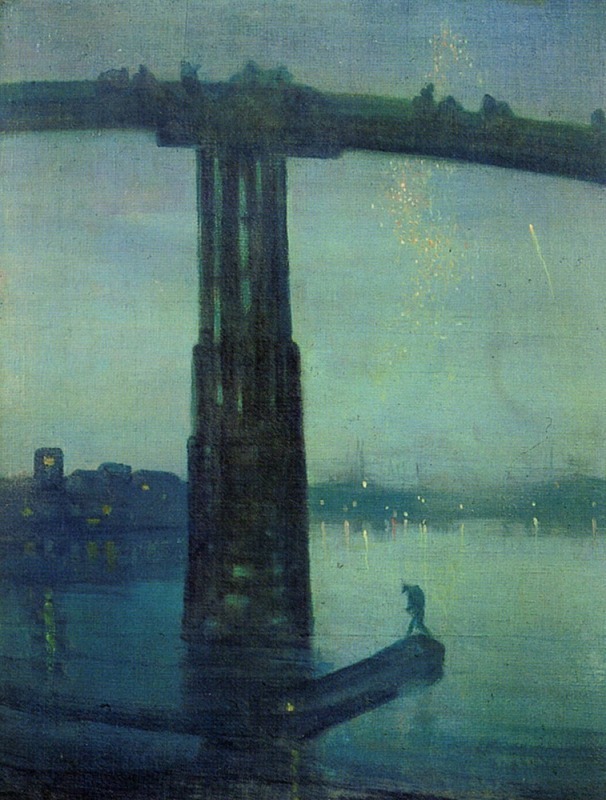 When Whistler painted Nocturne in Blue and Gold he composed the painting of the bridge by memory. He used a technique in which he visited the bridge and studied it, but didn't paint it while he was on the site. If you look closely you will see the fireworks in the background which he painted as The Falling Rocket. Whistler didn't have a watch and didn't care for clocks. Time meant nothing to him. Once when a man said he would meet him at "4:30 precisely", Whistler replied to him, "I have never been able and never shall be able to be anywhere at '4:30 precisely'". 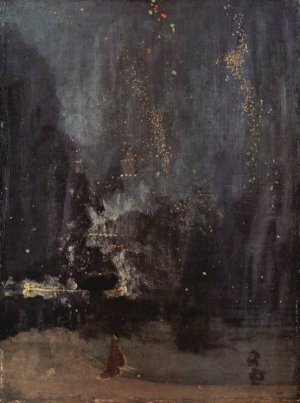 At the World's Exposition in 1893 which was held in Chicago, Whistler's paintings were exhibited in the American section, where they belonged. In 1888 he married a widow, Beatrix Godwin. Eight years later she died and he was devastated. In 1903 he became ill and died. The portrait of Whistler's mother, Anna McNeill Whistler, was almost rejected when he first presented it, but it has become a much-loved portrait in America. It was unappreciated for years. At one time it was offered in New York for $1200 and a buyer was not found. When it was exhibited in London it was scorned by the press. It was honored on a postage stamp in 1934 to commemorate Mother's Day. He called the painting An Arrangement in Grey and Black. He didn't want people to just think of it as his mother, but he wanted her to represent all aging mothers. He kept the painting in his home for many years and finally offered it to the French government for the price of 120 pounds. See more paintings by Whistler. This biography was written by Patsy Stevens, a retired teacher. Eddy, Arthur Jerome. 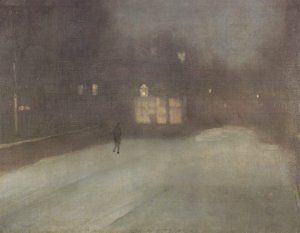 Recollections and Impressions of James A. McNeill Whistler, Philadelphia: Lippincott, 1904. Koval, Anne. Whistler, In His Time, London: Tate Gallery Publications, 1994. Press "Go" to search for Art Masterpiece Mysteries, Book 2. This page displayed 76,944 times.